Arteries and veins are responsible for circulating blood throughout the body. Veins are low-pressure vessels and carry deoxygenated blood from the body back to the heart. Arteries, conversely, are muscular and high-pressure vessels that transport oxygen-rich blood from the heart to the rest of the body. These symptoms often occur after experiencing a DVT. A DVT usually affects the lower leg and thigh and almost always presents on one side of the body. Blood Tests â€“ A blood test will help measure D-dimer levels, which are heightened in an effort to dissolve blood clots in the body. A physician may order other tests in order to rule out other causes of the symptoms. CT scans / MRI – these scans produce a visual topography of an individuals veins, which can aid in locating a clot. Clots are readily seen in the chest in these forms of imaging. A physician may order an x-ray to rule out other causes of the symptoms. When a patient is diagnosed with a pulmonary embolism, the aim of their treatment is to break down the current clot. Once blood clots are managed, treatment is geared towards preventing another occurrence of deep vein thrombosis. Blood thinners (anti-coagulants) these medications decrease the bloodâ€™s ability to clot, prevent existing clots from growing as well as reduce the risk of additional clots developing. These medications are taken for a period of 3- 6 months or for life if the clot was not provoked by trauma or immobility. These medications include daily injections or oral medications. Traditional oral therapy is completed using the drug warfarin, which is accompanied with weekly blood resting to adjust doses. However, new agents such as rivaroxaban (Xarelto) have been approved for use and to treat and prevent blood clots and do not require regular monitoring. These medications increase a patientâ€™s risk of bleeding. If bleeding does occur without resolution then the patient should seek emergency medical attention. Studies show that some people are genetically pre-disposed to abnormal clotting complications but anyone can develop a blood clot from trauma, immobility or a pre-existing medical condition that affects the bloodâ€™s ability to clot. The risk of the blood clot in the leg leading to a pulmonary embolism is heightened when certain risk factors are present. As discussed, the most serious complication associated with blood clots is a pulmonary embolism. Nearly 25% of those who experience a PE will die. The chances of survival, however, are high if the condition is identified and treated promptly. It is, therefore, essential to notify a doctor immediately if you experience any symptoms. The reason for this high risk is the lack of oxygen being transferred to vital tissues of the body because of a reduction in gas exchange from carbon dioxide to oxygen in the lungs. With sufficient oxygen tissues in the brain and body begin to die. 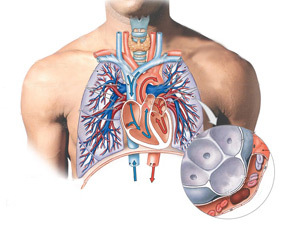 Patients often make a full recovery after a pulmonary embolism if treated promptly. The possibility for recurrence of PE is very high and patients should be on blood thinning / anticoagulation therapy long term to reduce this risk.